The 3400-year-old legend of flight tells how Daedalus fashioned wings of feathers and wax so he and his son Icarus could fly from prison on Crete to safety in Sicily. When Icarus flew too near the sun, the wax melted, the feathers blew away, and he fell to his death. Daedalus's flight and Icarus's fall have touched our minds ever since. Most ancient legends have some basis in history, and, I suspect, this one does as well. But as we go forward in time, legend slowly takes on the apparatus of history. 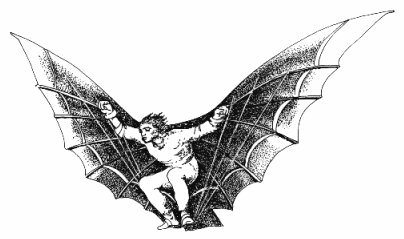 A ninth-century Moorish inventor named Ibn Firnas built wings and, like Daedalus, covered them with feathers. Firnas crashed and hurt his back. Later, he said he hadn't noticed how birds landed on their tails. He hadn't built a tail to help him land. And here the plot thickens. About that same time, the Vikings told a story with echoes of both Daedalus and Firnas, but with a new insight. Their hero, Wayland, made feathered wings to escape an island prison. he flew for more than the distance of a furlong. But, agitated by the violence of the wind and the swirling of air, as well as by awareness of his rashness, he fell, broke his legs, and was lame ever after. He himself used to say that the cause of his failure was forgetting to put a tail on the back part. Bits and pieces of the older legends seem to litter Eilmer's story. And he adds his own new bit of knowledge. If Firnas failed because he didn't have himself a tail to land on, Eilmer crashed because he didn't have a tail to provide lateral stability. So, you see, legend gains flesh and blood as experience accumulates. Finally the Wright Brothers added their chapter. This time, photos and documents backed up the legend. It seems clear at last that the old legends really had to've been more than flights of mere fancy. But flight (whether in legend or fact) has been reported as an all-male thing through most of history. Even angels were male until the 19th century. The situation began changing only when flight turned from a dream into reality. The Montgolfier brothers made the first manned hot-air balloon ascent on November 21st, 1783. Eleven days later, Alexandre Charles tested a manned hydrogen-filled balloon. Soon everyone was flying balloons, and they were reaching altitudes limited only by the fliers' ability to breathe the air. The first women flew within months, but only as passengers. A few days after the Montgolfier flight, hydrogen balloons began flying as well. One hydrogen balloonist, Jean-Pierre Blanchard, was an experimenter and barnstormer. He was first to drop animals in parachutes, first to try to control his flights with sails and rudders, first to cross the English Channel, and first to fly in America. When Blanchard finally suffered a fall and died in Paris, his wife, Sophie Blanchard, continued the family business. She'd taken up flying in 1805. She was the first woman we know to've flown on her own, and she made 59 ascents before she was done. But she decided to improve her act by flying at night and putting on a fireworks display. Of course hydrogen is ferociously flammable. It caught fire and burned off. The balloon lost buoyancy and fell to a high rooftop. At that point Sophie might yet have survived, but wind caught the deflated cloth and dragged her off the edge, where she fell to her death. Even before Sophie Blanchard women had been putting themselves on display in the sky. No sooner did people go up in balloons than they also began parachuting back to earth. 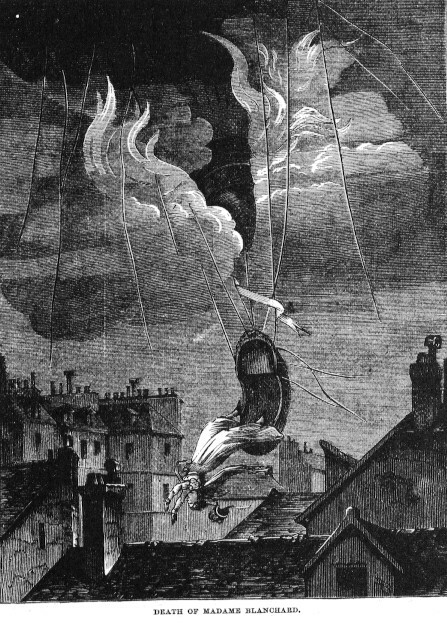 André Garnerin first parachuted from a balloon in 1797. He talked his wife into making one jump, and that was enough for her. But his niece took up parachuting for a living. From then on women kept on parachuting. The same year the Wright Brothers flew, Buffalo Bill Cody took his wild West show to London. Cody had trouble there. When he put on a blindfold to shoot a plaster egg from his wife's head, the bullet creased her scalp. A 16-year-old girl, Dolly Shepherd, came out of the audience to take her place. To thank her, Cody took her to an aeronaut's workshop. There Dolly found work as a parachutist and soon became the star of the troupe -- heady and dangerous work for a young girl. She saw her first fatality when a girl in the troupe landed on a factory roof and, like Sophie Blanchard, was dragged over the edge. Others died. Dolly herself was almost killed several times. In a typical jump, two girls got ready. They opened a vent hole in their balloon so it would start down. Then they jumped. One day, after Dolly had vented the balloon, she found the other girl's ripcord was jammed. The two had to jump together from 11,000 feet using Dolly's small parachute. Dolly was badly shaken up. While she was getting her strength back, her mother secretly jumped in her place. Dolly jumped again, but she began seeing the face of Death in all this and gave it up. Two years later she took up safer work; she joined the war in France as a driver-mechanic. She was 96 when she died in 1983. She lived to see people on the moon and a rocket circling Saturn. She lived to see women in rockets that were just as new and primitive as the parachutes she'd used 80 years before. So this was more than just a matter of women being pushed over the edge as a source of cheap excitement. Flight was also a means by which many women, tied down by the social climate of a century ago, looked for a way to slip the all-too-surly bonds of Earth. The Contessa Grace di Campello Della Spina gives us whole different view of this process. In 1907 she wrote an article that began with the words "Sport of the Gods!" Queen Margherita of Italy had founded the Roman Aero Club in 1904. The Contessa was an ardent member, and her sport of the Gods was ballooning. She tells how to pack for the trip. Bring the simplest and most practical tailor-made suit of light wool. Take an umbrella. The sun bites hard in the South. She chooses her food carefully. It should be light and easily eaten. French Prunes, raisins and chocolate -- cold tea, mineral water, and well-baked bread. Bring a light volume of your favorite author, and no alcohol save a small flask of brandy in the case of faintness. The trip ends in a cornfield. The peasants, seeing us descending, ran from all sides to help pack the balloon, and claim damages for the corn. They are most primitive and full of rustic curiosity. Next day they catch a train back to Rome. The trip takes 24 hours on the ground. She's back to the hard earth. The honeymoon has ended. A few years later, those balloons would become a weapon in the most terrible war we'd ever seen. And, when the smoke cleared, we'd begun dismantling the Contessa's royal class. Meantime, with all that money to lavish on play, she'd really been a valid ally of human progress. It was about pleasure, and pleasure has always driven the best technologists. But new technologies make fine ports of entry for the disenfranchised. Black technologists started making their mark in telegraphy and electric lighting in the 1880's. The peer structures weren't established. There was no one to wall them out. Women likewise got into the business of flight. And with heavier-than-air flight the name of the game shifted again. Here's one for you: Where do you think the hobble skirt got its name? It was invented on the spot in 1908. 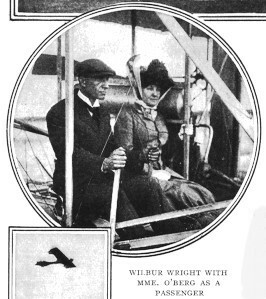 A French fashion designer saw the mincing steps of a Mrs. Hart Berg leaving Wilbur Wright's airplane in France. She was the first American woman to ride in an aeroplane, and she'd tied a rope about the bottom of her skirt to keep it from blowing in the wind. Mrs. Berg was still functioning in the same mode as the Contessa. But the first American woman piloted a plane two years later, and she echoes the shifting drive toward women's suffrage. Blanche Scott managed to get into Glen Curtiss's new flying school. But Curtiss didn't like the idea of women flying, and he'd blocked the throttle on her plane so it would only taxi. Scott somehow managed to override the block and get herself 40 feet into the air. Two weeks later a woman named Bessica Raiche soloed quite intentionally. But Raiche eventually gave up flying to become a doctor. Julia Clark was the first woman to die in a crash. She learned to fly in 1911 and died practicing for an exhibition two years later. Harriet Quimby was the first American woman licensed to fly, in 1912. A year later she was also the first woman to fly the English Channel. Quimby was a stunning beauty and a natural public figure. But the same year she flew the Channel, she also tried to fly an overweight passenger in Boston. He lurched in his seat, and the airplane went out of control. Both fell out and were killed while the airplane somehow righted itself and landed safely. Women were amassing firsts and setting records just before WW-I. Then women wanted a piece of the action as it became clear that airplanes would play a role in the war. But at that point the wall went up. The military strongly opposed involving women in war. The woman who got closest to combat was Katherine Stinson -- older sister of airplane builder Eddie Stinson. It was she who got him into the business. First she trained Allied pilots at her own flying school. Then she went to France as an ambulance driver, where she did some flying for the Red Cross. She was a superb pilot who'd already set several flight endurance records. But war reasserts the male principle. By 1918 women had lost the ground they'd gained, and not only in flight. Yet women had firmly established their courage, determination, inventiveness, and natural ability to fly. Black Americans were as disenfranchised as women early in this century. It's no surprise that they too looked to the sky for freedom. The first black flyer was Eugene Bullard. He joined the French Foreign Legion in WW-I, then transfered to the French flying service. on the edge of poverty, picking cotton in a region of lynchings and a highly active Ku Klux Klan. Bessie was smart and determined. She learned to read, got books from a local library, and read to her family at night: the Bible, Uncle Tom's Cabin, books about Booker T. Washington and Harriet Tubman. She finished the eighth grade and a term at a black normal school in Oklahoma. Back in Waxahachie, she did laundry and dreamt of a larger life. During WW-I, she packed off to Chicago. For four years she worked as a manicurist and read about the new heroes of flight in France. She wanted to fly, but no American flying school would have her. So she learned French in night school, saved her money, and, in 1921, she sailed for France. She was beautiful, and we find hints that she used her beauty in raising that money. But times were very hard, and Bessie Coleman did what she had to do. In France she got into the Coudron Brothers' School of Aviation. There she flew Nieuports -- the same airplane my father had so loved to fly when he flew in France two years before her. Like him, she wrote about the smells, sounds, and sensations of early flight. She graduated in 1922 and returned to a very different America. Now she'd been licensed to fly by the best. She joined the community of black intellectuals in the Harlem of the '20s. And she hatched a plan to set up her own flying school. The next year she was back in Europe drumming up support for the idea. Anthony Fokker entertained her in Holland. He showed her his airplane factories and vowed his support. Former German pilots entertained her in Berlin. She barnstormed America to raise money for the project. She became a darling of the white press. Back in Texas in 1925, she did air shows in Houston and Dallas. Then she went back to Waxahachie for a show. The gates and bleachers were to be segregated. She drew a line: No show unless black and white entered by the same gate. The management agreed. -- Of course, the bleachers stayed segregated. 1926 found Bessie Coleman scouting a parachute jump site in Jacksonville. The controls of her Curtiss Jenny locked. The plane spun and she fell to her death. She was only 30, and all that remained, hanging in the clear air above her, was a huge legacy of loving life. Her flight came late in the string of early transatlantic crossings that tested and probed Nature -- each as dangerous as the last, each still dependent on specially-built airplanes. Markham's east-to-west crossing was the last ad hoc challenge to Nature that had to be made before commercial transatlantic traffic could begin three years later. Nature rapped Markham's knuckles right smartly. She ran out of fuel over open sea before she got to Cape Breton. Her Percival Vega Gull aeroplane sputtered its last just as land came into view. She upended in a peat bog a few miles short of her intended landfall and stumbled out with a badly cut head. But Markham's more remarkable feat wasn't in the air; it was in literature. Her one book, West With the Night, is a tour de force arriving out of some unexpected aether. And we wonder how! Beryl's maiden name had been Clutterbuck. She was born in England in 1902, and her father took her to Africa when she was four. She got the name Markham from her second husband. She grew up on a Keyna farm, learned to hunt with African boys, and was once mauled by a lion. Her schooling was minimal. She took up horse training in her late teens and flying in her late 20s. By then the beautiful Markham had married twice, mothered a son (whose father may've been the Duke of Gloucester), and was woven into the decadent, upper-class, expatriate English life of pre-war Africa. She was a friend of Isak Dinesen (played by Meryl Streep in the movie, Out of Africa). But the friendship suffered when Markham took up with Dinesen's real-life Robert Redford character. Until she went to England for her transatlantic flight, she flew airmail in Africa, she rescued wounded miners and hunters in the bush, and she spotted bull elephants for rich hunters. She was a serious adventure-junkie. After the Atlantic flight she wrote her book about life in Africa and life in the air. The book is astonishing -- extraordinary writing by any measure. Hemingway said it made him ashamed of everything he'd ever written. No doubt she had some help from her third husband, writer Raoul Schumacher. But how heavily was he involved? Rough drafts show editorial markings in both their hands. The problem is, Schumacher never wrote anything else to approach it, while Markham never wrote anything else at all. So where did this masterpiece come from? I suspect Markham was a creative coiled spring, wound tight by life on the edge -- a spring that uncoiled only once, leaving us all the richer for that one great whirl of expression. And if the lives of Coleman and Markham were complex and shot through with moral ambiguities, even more was the life of the most famous woman flier of them all -- Amelia Earhart. Earhart was practically made for her role. She and Lindbergh were two peas from the same pod. Both were lean and shy. They had the same mouth, same eyes, same short hair. And so, in 1928, the year after Lindbergh flew the Atlantic, Philadelphia socialite Amy Guest had asked publisher George Putnam to organize a transatlantic flight in her own Fokker Trimotor. Putnam found a pilot to fly it. Then he interviewed women to find, and I quote, "[a] girl who would measure up to adequate standards of American womanhood." She would keep the flight log. Earhart did her homework. Don't be too appealing; that might cause Putnam to be protective. Don't make a big deal of the fact you're also a pilot; they want only a second banana. She showed up looking just like Charles Lindbergh, kept her mouth shut, and got the job. 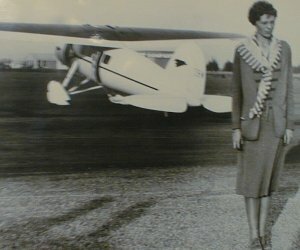 She became the first woman to make the flight. She stepped out of the plane into a media maelstrom that never ended for her. Earhart was the hottest item in the papers, even if she had been only a passenger. Putnam became her publicist. He booked high-pressure speaking tours and fed stories to the press. Putnam made it hard on other women pilots. It was an odd symbiosis. He manufactured her fame, and she rode the wave -- until she began drowning in it. Idealism drove Earhart. She started out to be a poet. She'd learned to fly from a rare woman instructor named Neta Snook in California. By the time she rode across the Atlantic, she was a seasoned pilot making her living as a social worker in Boston. 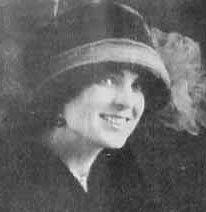 Then she married Putnam in 1930. It began as a marriage of convenience between two workaholics. She made Putnam sign an agreement so she could dissolve the marriage after a year if she chose to. Still, the marriage seems to've gained in meaning as the mad whirl went on. For nine years Putnam managed Earhart -- pushing an able pilot into the limelight over better fliers. Earhart finally flew the Atlantic solo in 1932. All the while she wished she had the mind-space to write poetry, but she never had time to meet her own standards. Instead, she used her bully pulpit to push things she believed in: women's rights, pacifism, and flight. And, make no mistake, she was absolutely dedicated to all three causes. Then she set out to fly around the world. If she'd made it, the flight might've been forgotten. But she vanished at sea, and we've spent the last 62 years wondering what became of her. Was it cover for naval spying on the Japanese? One theory says Earhart used it to vanish from the public eye and lived under another identity for years after. It was surely just bungled navigation. Still, the dropping-out-of-sight theory reflects the sad truth of her plight. For she was shy, bright, and caught in the web of dubious success. And we're left to wonder what she might've said in her book of poetry. The great blue belly arches up above the water and bends down behind the line of the horizon. It's a sight that has exhausted its magnificence for me over the years, but now I seem to be seeing it for the first time. More and more now, I remember things. Images, my life, the sky. Sometimes I remember the life I used to live, and it feels impossibly far away. It's always there, a part of me, in the back of my mind, but it doesn't seem real. Whether life is more real than death, I don't know. What I know is that the life I've lived since I died feels more real to me than the one I lived before. Perhaps I'm attracted to Mendelsohn's book because she voices my own question: "What did all that heroism mean?" Historian David McCollough offers a clue. He identifies two odd attributes of early fliers. They looked good and they wrote. I go back to a photo of my father in a WW-I flier's uniform -- a handsome young man who went on to become a writer. I go back and look at photos of Harriet Quimby, Bessie Coleman, Beryl Markham, Amelia Earhart. They're all beautiful. An odd selection process is running here. Take Lindbergh: He wrote books, and his lovely wife, Anne Morrow Lindbergh (who also flew), created a body of literature quite apart from flight. The flier St. Exupéry wrote many books, including The Little Prince -- a masterpiece of the children's literature. He and the Lindberghs were close friends, drawn together by words as much as by flight. We began at the first hour of morning. We began when the sky was clean and ready for the sun and you could see your breath and smell traces of the night. We began every morning at that same hour, using what we were pleased to call the Nairobi Aerodrome, climbing away from it with derisive clamour, while the burghers of the town twitched in their beds and dreamed perhaps of all unpleasant things that drone -- of wings and stings, and corridors of bedlam. Was that prose borne out of literary genius or out of the experience of flight? My images of flight were powerfully formed by my father's story-telling. I lay in bed while he made up stories laced with images of turning and wheeling among pillars of clouds, of danger, fear, walking away from crashed airplanes, of the sounds and smells of flight. And so they wrote. Nevile Shute wrote and Ernie Gann wrote. Amelia Earhart wrote prose when she wanted to write poetry. St. Exupéry wrote, "I saw the alchemy of perspective reduce my world, and all my other life, to grains in a cup." Lindbergh said the airplane plunged him into the heart of the mystery of existence. I think the airplane created the prose. And the attractiveness? Maybe that ties into Abe Lincoln's remark that after a certain age we bear responsibility for our face. Maybe these people accepted that responsibility. Perhaps St. Exupéry catches a wink of the meaning of it all when he describes a pilot on a night flight "falling into the deeply meditative mood of flight, mellow with inexplicable hopes." All this is inconclusive, I know. I offer a picture of flight that's terribly complex and unresolved. At first it looks like a simple tension among exploiters and exploitees. Men exploiting women for thrills -- women exploiting opportunity to gain liberation. But when you read the prose it generates, all this exploitation becomes embedded in another theme entirely. For early flight offered a transcendent sensate experience. And that experience seems to have overpowered all else. That's the part that finally seems to become clear in the writing. Nothing as base as mere exploitation could've created all those haunting words -- or that moral force -- or such a sheer cry of pleasure. Note added on 04/10/2018: Barbara Lebedova translated this talk into Slovak. Click here for her translation. Note added on 03/14/2019: Michael Taylor translated this talk into Russian. Click here for his translation. White, L., Jr., "Eilmer of Malmesbury, An Eleventh Century Aviator," Medieval Religion and Technology. Los Angeles: University of California Press, 1978, Chapter 4. Scott, P., The Shoulders of Giants: A History of Human Flight to 1919. Reading MA: Addison Wesley Publishing Co., Chapter 1. Lomax, J., Women of the Air. New York: Ballantine Books, 1987. Oakes, C.M., United States Women in Aviation through World War I. Washington, D.C.: Smithsonian Institution Press, 1985. Freydberg, E.H., Coleman, Bessie (1896-1926). Black Women in America: An Historical Encyclopedia, (ed., Darlene Clark Hine). New York: Carlson Publishing Inc., 1993, pp. 262-263. Rich, D.L., Queen Bess: Daredevil Aviator. Washington, D.C.: Smithsonian Institution Press, 1993. Moolman, V., Women Aloft. Alexandria, VA: Time-Life Books, 1981, pp. 43-45. Markham, B., West with the Night. San Francisco: North Point Press, 1983 (1st ed., 1942). Lovell, M. S., Straight on Till Morning. New York: St. Martin's Press, 1987. Boyles, D., African Lives: White Lies, Tropical Truth, Darkest Gossip, and Rumblings of Rumor -- from Chinese Gordon to Beryl Markham, and Beyond. New York: Ballantine Books, 1989, Ch. 3. Earhart, A., The Fun of It. New York: Brewer, Warren & Putnam, 1932. Loomis, V.,V., and Ethell, J.L., Amelia Earhart: The Final Story. New York: Random House, 1985. Lovell, M.S., The Sound of Wings: The Life of Amelia Earhart. New York: St. Martin's Press, 1989. Ware, S., Still Missing: Amelia Earhart and the Search for Modern Feminism. New York: W.W. Norton and Company, 1993. Mendelsohn, J., I Was Amelia Earhart. New York: Alfred A. Knopf, 1996. McCullough, D., Brave Companions: Portraits in History. New York: Simon & Schuster, 1992, Ch. 9.